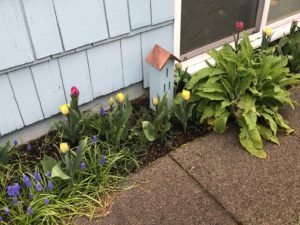 Tulips coming up in my garden, raindrops on budding trees. Making windchimes and light-catchers for the garden, cultivating moss, making kombucha and today heading out to Palm Springs to get some sunshine and joy. Lots of Tara Mohr and Anna Holden; the Magical Unicorn Handbook (for sensitive people), 5 Ways Sensitivity Makes Us Stronger and So You’re Highly Sensitive, What does that Mean? Cost of living surging in US cities, not surprisingly including Seattle. On Nat Geo’s apology of how it has portrayed race and a discussion about how we should do it. You Deserve Someone Who’s Sure About You and the Ways You Know It Isn’t Love.